"My husband and I would highly recommend Erin Muslera in either looking for a home or selling your home. Erin has bought and sold three homes for us in the last year and she was in it with us 150% of the way! Some of the many reasons we feel so positive about Erin are that she is optimistic, positive, communicative, extremely hard working for all of her clients, persistent, meticulous, showing a lot of attention to detail and follow through. Lastly, and maybe more importantly, she is creative, pleasant and extremely knowledgeable of the local market. You will not be disappointed if you choose Erin to be your guide in choosing YOUR perfect home! " - Mara & Ken H.
"As first time home buyers, my husband and I feel so lucky to have found Erin. We had heard many stories of the frustrations of purchasing a house but when everything was said and done we feel so fortunate to be able to say that we had the best home-buying experience with her. When we first met Erin she impressed us with her knowledge of the business and felt like she understood what we were looking for in a home. We found our house the first day of visiting open houses with her. She was very organized and guided us through every step of the escrow process. She was always available and responsive if we had questions; she was a critical piece to keeping everyone on track in the last days of escrow. We would recommend Erin to anyone looking for a committed realtor that will take the time to get to know you and find a house that is right for you! " Erin Muslera epitomizes energy, positivity, and enthusiasm. Although she grew up in the heartland of Indiana, she has spent the majority of her life living in various coastal cities including Seattle, Melbourne and Sydney before settling down in Santa Barbara in 2002. Naturally drawn to real estate, she has been involved with the local and national markets in various capacities since 2005. With a degree in engineering, a long history of project management, customer service and communications, Erin brings a sharp attention to detail, organization, and marketing to the clients. She considers it a top priority to ensure a productive experience for all parties involved in a transaction: buyers, sellers, cooperating agents and colleagues. Her genuine love for Santa Barbara and people, combined with strong sensibilities for negotiation, make her a natural in real estate. 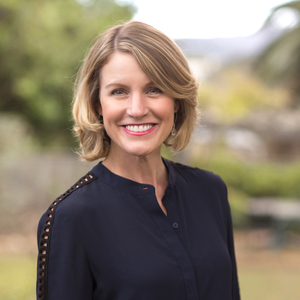 Passionate about being involved in the community, Erin has served in the Junior League of Santa Barbara for nearly ten years and was acting president of the non-profit from 2011 - 2012. Her love of music and community lead her to serving as a deejay and host to the morning program, Audio Pleasure, on Santa Barbara's own non-commercial radio station, KCSB 91.9 FM for seven years. Being committed to a bilingual (English and Spanish) lifestyle, Erin, her husband, and two young boys travel to Argentina and other Spanish-speaking countries as often as possible. She enjoys spending time with her family, friends, and staying active with pilates and hiking.